ViewSonic introduces a series of ViewSync projectors to provide a solution for multimedia sharing and diverse applications. The new line of ViewSync projectors comes with a wide range of wired and wireless connectivity options, making access to your projectors more flexible. Now you can conduct lectures and play media content from PCs, mobile devices, or without a computer at all. With optional Wi-Fi dongle, the WPD-100, and the vPresenter app for Android and iOS mobile devices, you can wirelessly stream multimedia content directly onto ViewSync projectors. Alternatively, you can simply plug-and-play via a single USB cable to quickly connect your laptop and start presenting. It also features PC-less presentation capabilities that let you start presenting material directly from a USB flash drive. 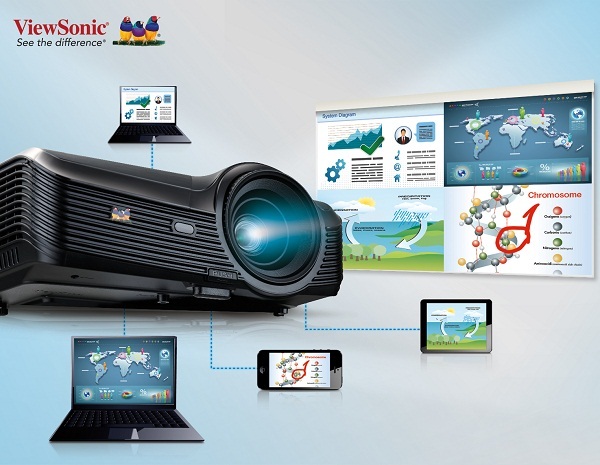 ViewSonic ViewSync projectors offer versatile connectivity options for added convenience and flexibility. By utilizing RJ45 LAN connections or by plugging in a USB flash drive, you can display presentations without connecting to a computer. The embedded Office Viewer allows the projector to display Word, Excel, PowerPoint, as well as PDF files straight from a USB flash drive without the need for a computer. Moreover, these projectors also support multimedia content, such as music, images, or photos to enrich presentations. Aside from using a USB flash drive, you can also use a quick, simple plug-and-play USB connection to connect to a computer without running a bulky connection cable. Using ViewSonic’s mobile app, vPresenter, you can send information from your mobile devices to the projector as well. The mobile app is available on both Google Play (for Android devices) and the Apple App Store (for iOS devices). In addition, the ViewSonic mobile app offers live draw and live cam functions to create an interactive experience for your presentations or lectures. ViewSonic ViewSync Technology enables you to project content simultaneously from up to 4 PCs, or from smart phones and tablets, via wired or wireless LAN, to one display screen. In addition, you can download ViewSonic’s exclusive vPresenter APP from Google Play and the Apple App Store to enable live draw and live cam functions to create an interactive experience for your presentation. This allows you to easily annotate and share your presentation files and conduct interactive lectures and presentations to your audience. The vPresenter Live Cam function also allows users to stream live videos straight from a mobile device’s camera to the projection screen. This feature offers a fantastic way for a more vivid presentation environment. ViewSonic ViewSync projectors now include ViewSync PJD7333 (high bright XGA), PJD7533w (high brightness WXGA), PJD8333s (ultra short throw XGA), PJD5533w (portable WXGA), PJD6345 (portable XGA), and PJD6544w (widescreen WXGA). More new models are coming soon to complete the product line of ViewSonic ViewSync projectors and will be the perfect aid for all enterprises, educational, and medical institutions.